ASUNCION, Paraguay (AP) — Paraguay's Senate removed President Fernando Lugo from office in a rapid impeachment trial on Friday, and the leftist former priest said he was stepping aside even though he considered his ouster a blow to democracy. Vice President Federico Franco was promptly sworn in as president after tense hours during which Lugo's supporters massed in the streets facing off with riot police. The outgoing president, who was elected on pledges of helping the poor, averted the potential for a bigger conflict by appearing on television and saying he would comply with the Senate's vote. "I say goodbye as president," a smiling and gracious Lugo said shortly after the Senate vote. He said, however, that Paraguay's democracy "has been deeply wounded." Franco, who had parted ways with Lugo in recent years, triumphantly donned the presidential sash and declared: "At this time, God and destiny wanted me to assume the presidency." The Senate tried Lugo on five charges of malfeasance in office, including an alleged role in a deadly confrontation between police and landless farmers that left 17 dead. After the five-hour trial, 39 senators voted to dismiss Lugo, while four senators voted against and two were absent. It was a dramatic demise for the once-popular leader who previously had stepped down as a popular Roman Catholic "bishop of the poor" to run for the presidency amid a leftward swing in South America. Lugo's removal after nearly four years in office highlighted his inability to find a balance with one-time allies who increasingly disapproved of his leftist policies and strident, uncompromising style. 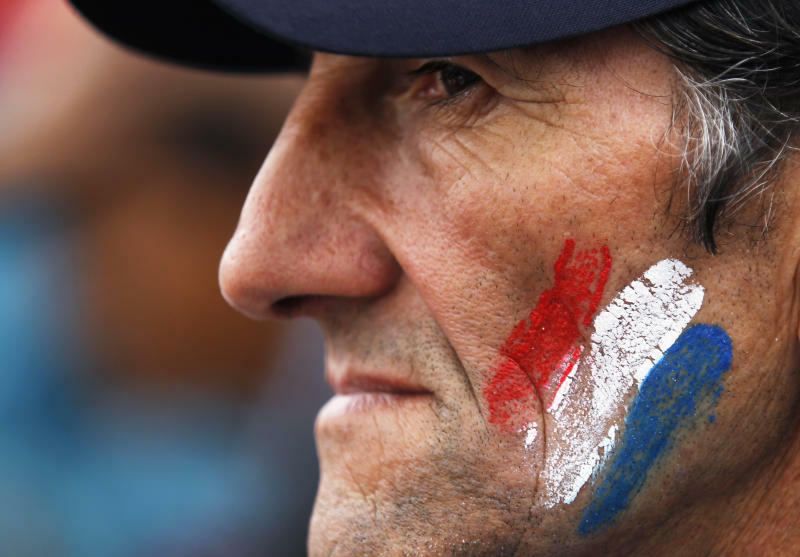 The trial came a day after Paraguay's lower house of Congress voted to impeach Lugo. Crowds of pro-Lugo protesters took to the streets condemning the impeachment trial and expressing support for the president. When several dozen young protesters tried to break through a police barricade to reach Congress, police in anti-riot gear drove them back on horseback and using tear gas and water cannons. Some protesters listened to the vote on speakers set up in the street, and booed lawmakers who voted for Lugo's dismissal. When the vote was over, some chanted "Lugo president!" Others wept. After Franco's swearing in, the crowd of protesters waned. Franco, of the Authentic Radical Liberal Party, is now to serve out the rest of Lugo's term, which ends in August 2013. The 49-year-old Franco has political experience as a former state governor and at first had been part of a political alliance that supported Lugo. Lugo decided not to attend the trial, instead watching on television from the presidential palace while his lawyers spoke on his behalf. The Senate rejected a request by his lawyers for a period of 18 days to prepare their arguments. The Senate's president, Jorge Oviedo, said there were no grounds for such a request. "I'm angry. More than because of the impeachment trial, because of the reaction of the Liberals who are celebrating as if they won elections," said protester Fiorella Galli. "The country is in a complete situation of insecurity and instability." A smaller group of pro-Franco demonstrators gathered for a separate rally during the congressional proceedings, holding signs reading: "The trial is constitutional." Afterward, Lugo left the presidential palace as the military guard formally saw him off with a bugle tune. Venezuelan President Hugo Chavez said he won't recognize the "illegal and illegitimate government" that replaced Lugo. Speaking to reporters in Caracas, Chavez said his ally "preferred the sacrifice" of stepping aside, and that the trial had been a setup. Ecuador's president, Rafael Correa, said his government also wouldn't recognize any government in Paraguay other than Lugo's. "This goes beyond Fernando Lugo. It goes beyond Paraguay. It's about true democracy for all of our America," Correa said on television. As flag-waving protesters took to the streets in Asuncion before the trial, many schools shut down and shops closed their doors as a precaution. The impoverished, landlocked nation has a long history of political instability. 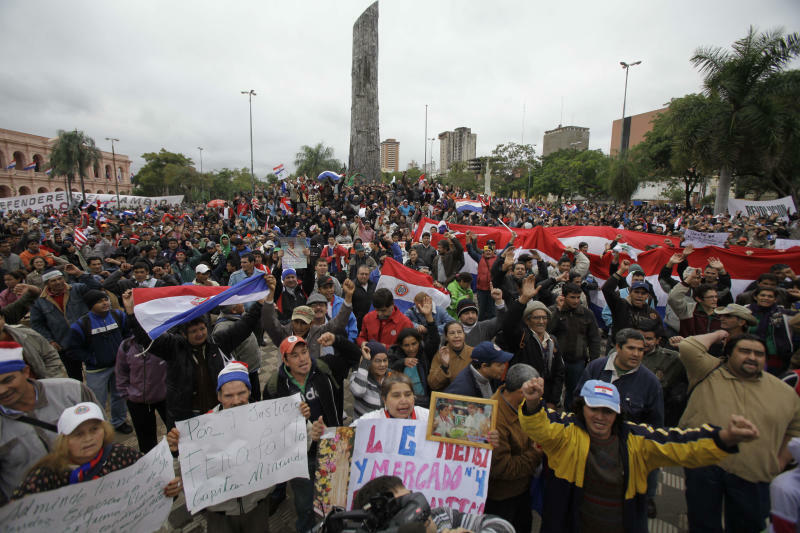 Some in Paraguay were initially concerned that the political showdown could spark street protests such as those that followed the 1999 assassination of Vice President Luis Maria Argana. Some analysts said later that Lugo's quick acceptance likely avoided a more severe and potentially bloody crisis. "He seems to have handled it very well, considering he had no real opportunity to mount a defense. So far his actions have probably prevented violence," said Stephen Johnson, director of the Americas Program at the Center for Strategic and International Studies in Washington. "When all the dust settles, Paraguay will need to amend its impeachment procedures to assure a more transparent, orderly process. Presidential removal is an area where many Latin American constitutions are weak." Lugo was elected four years ago on promises of agrarian reform to help the country's many poor and landless people, but his more moderate government allies have increasingly turned against him in recent years. Lugo's impeachment trial was triggered in part by an attempt by police to evict about 150 farmers from a remote, 4,900-acre (2,000-hectare) forest reserve, which is part of a huge estate. Advocates for the farmers said the landowner, a politician, used political influence to get the land from the state decades ago, and say it should have been put to use for land reform. Six police officers, including the brother of Lugo's chief of security, and 11 farmers died in the clash last week. Lugo's opponents blamed the president. Lugo had expressed sorrow at the confrontation and accepted the resignations of his interior minister and his chief of police. 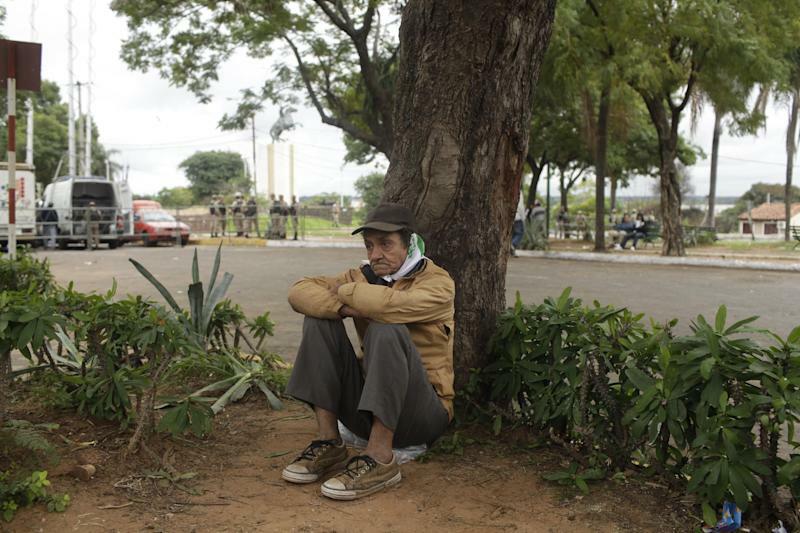 The president also was tried on four other accusations, including that he improperly allowed for leftist parties to hold a political meeting in an army base in 2009; that he allowed about 3,000 squatters to illegally invade a large Brazilian-owned soybean farm; that his government failed to capture members of a guerrilla group, the Paraguayan People's Army, which carries out extortion kidnappings and occasional attacks on police; and that he signed an international protocol without properly submitting it to Congress for approval. Lugo's support had steadily eroded recently, while his opponents had grown stronger, said Michael Shifter, president of the Inter-American Dialogue think tank in Washington. "It is hard to see the offenses leveled against him as anything but a pretext for removing an unpopular president," Shifter said. "If presidents were ousted because of the reasons cited in this case, there would be few Latin American presidents left in office," he said. "The opposition simply didn't agree with Lugo's policies and didn't approve of the way he governed. As a result, the opposition manipulated the system, adhering to the letter of the law but departing from the principle of democracy." Lugo's election in 2008 had ended 61 years of rule by the Colorado Party, and he had regularly clashed with Congress, where he had few firm allies. Lugo's relationship with Franco and the moderate Authentic Radical Liberal Party quickly deteriorated after he was elected with their support. His partners were upset after he gave a majority of Cabinet ministry posts to leftist allies, and handed a minority to the moderates. Conflicts also developed as leftist groups of landless farmers began to invade large soybean and cattle farms, trying to force the government to expropriate them. Lugo's government didn't have enough funds to pay compensation to farm owners, and the land seizures upset politicians who previously supported the president. The political split had become sharply clear as Lugo publicly acknowledged that he would support leftist candidates in future elections. A delegation of foreign ministers from the Union of South American Nations, or UNASUR, traveled to Paraguay ahead of Friday's trial to attempt to intervene. After the Senate's verdict, Venezuelan Foreign Minister Nicolas Maduro denounced it as a "new type of coup." "A truly shameful act has been committed," Maduro told reporters. Costa Rica's government also deplored Lugo's dismissal, saying in a statement that it would offer him asylum if necessary. Associated Press writers Luis Andres Henao in Santiago, Chile, Gonzalo Solano in Quito, Ecuador, and Ian James and Jorge Rueda in Caracas, Venezuela, contributed to this report.